Potential truck customer Jeff Gendron, left, talks to salesman Bob Daniels at Clark Chrysler-Jeep-Dodge in Methuen, Mass., last week. The issue: Chrysler has considerable leverage to cut dealerships in bankruptcy court. Whats next: The company will choose dealerships that will survive with the reorganized Chrysler. 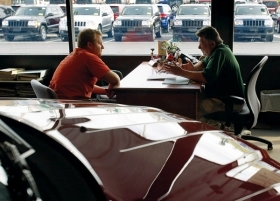 The government says terminated dealerships will wind down operations in an orderly way. DETROIT — Chrysler LLC has a potent new weapon to thin its dealership roster: Bankruptcy Court. In a move that rocked dealers last week, the company filed for Chapter 11 reorganization in U.S. Bankruptcy Court for the Southern District of New York. Then a top Chrysler executive announced that the company will eliminate dealerships. "We don't have the volume and revenue to support the dealer body we have," co-President Jim Press said last week during a telecast to dealers. Bankruptcy Judge Arthur Gonzalez has the authority to tear up contracts and sidestep legal requirements — such as state franchise laws — that dealers traditionally use to protect their franchises. Surprisingly, pressure to cut dealerships is coming from the U.S. Treasury. In a teleconference with dealers Thursday, April 30, Press said Chrysler wants most dealers to carry all three brands — Jeep, Dodge and Chrysler — under one roof. He also said the Chrysler that emerges from bankruptcy would have fewer dealerships. But Press did not reveal how many dealerships Chrysler wants to retain. "We've just started through the process, and we're doing a good surgical evaluation," Press said. "We're committed to not including a substantial number of dealerships." Chrysler already has been consolidating dealerships under a plan called Project Genesis, launched last year. As of March 31, 1,993 of its 3,215 dealerships carried all three brands. Chrysler's reticence about its consolidation plans raised tension among dealers last week when the White House released a statement that said Chrysler has identified dealerships that will be dropped. The White House, which is coordinating Chrysler's reorganization, says the new Chrysler could emerge from bankruptcy in 30 to 60 days. But the statement also warns: "It is expected that the terminated dealers will wind down their operations over time and in an orderly manner." The White House statement also said GMAC Financial Services, which will replace Chrysler Financial as a lender for dealers' inventory and auto financing, has identified some Chrysler dealers as "risky credits" that also will be dropped. While GMAC says it will offer temporary floorplan financing to all dealers, it will conduct a complete financial review of Chrysler dealers within a few months. Chuck Eddy, a Chrysler dealer in Austintown, Ohio, has participated in meetings between the National Automobile Dealers Association and the U.S. Treasury Department's automotive task force. Eddy, who is Chrysler's representative to NADA, says the task force favored eliminating some dealerships. Said Eddy: "It's not what Jim Press wanted to do. "Unfortunately, Chrysler is going to be faced with some decisions on the network," he said. "Bankruptcy should not be used to attack the network. Treasury had this opinion that the network was part of the problem. The network is not part of the problem. It's a source of revenue." Some dealers say their task now is to persuade the company and court to treat dealerships fairly. "I believe the intent of the company and the government is to preserve the dealers," says David Kelleher, who owns two Philadelphia-area Chrysler dealerships. "Dealers are a necessary asset of the corporation that Fiat is interested in. I don't think anyone wants them to tank." Ray Huffines, CEO of Huffines Auto Dealerships, a group of eight stores in the Dallas area, says financial viability will play a big part in decisions about which dealers will survive. "If a dealer is on the brink of going over, it might be farewell for them," Huffines says. "We're financially strong, and I don't think Texas is where their biggest concern would be. It's a growing area, and we're not at the point of being overdealered like the Northeast part of the country." Some dealers say they may not be so lucky. Dealers who have not participated in Project Genesis fear that Chrysler's bankruptcy and the dealers' switch to GMAC represents an opportunity to eliminate stores. Said one Michigan dealer: "Who knows how they decided? I'm absolutely scared to death they're going to terminate me because I don't have Dodge."